The most powerful ground-based solar telescope captured details about active sunspots previously thought to be relatively calm. The surface images show the dark central umbra surrounded by the filamentary penumbra. Recent observations from the largest solar telescope on Earth reveal a never-before-seen look at fine structures on the sun. 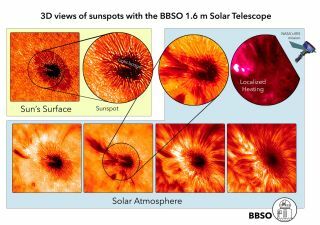 The measurements, taken at Big Bear Solar Observatory (BBSO) in California, show that sunspots, once considered relatively quiet regions, can be surprisingly active. The telescope also captured images of unusual events known as three-ribbon solar flares, a powerful rearrangement of the sun's magnetic field that is associated with the eruption of charged material into space. You can watch a video of the sun's detailed structure as seen by the BBSO. "It provides the highest resolution solar images that are now available," Alexander Kosovichev, of BBSO, said during a news conference earlier this month during the 224th meeting of the American Astronomical Society. Kosovichev and his team used the NST to create unique three-dimensional views of sunspots. "In solar physics, it's critical to get this resolution," Kosovichev added. Although scientists have known about sunspots since astronomer Galileo Galilei identified them more than 400 years ago, the solar blemishes still remain a mystery. The compact, concentrated magnetic fields can reach sizes as large as the planet Jupiter, and can last for weeks. No force on the surface of a star is capable of holding these powerful structures together, but the method by which sunspots remain stable is still unknown. Using the Big Bear Solar Observatory, Kosovichev and his team resolved what he called the "previously hidden" structure of the central region of a sunspot, known as the umbra. Over the course of five hours, the team captured images from a sunspot that appeared in September 2013. They created a 3D movie that revealed just how active the umbra is. "This makes a big difference in understanding sunspot dynamics," Kosovichev said. The movie shows shockwaves created as the sunspot pulsed, a process that affects the solar atmosphere around it. It also shows the flow of material into the dark central region, where temperatures at 7,000 degrees Fahrenheit (3,870 degrees Celsius) are cooler than the surrounding 10,000 F (5,500 C) solar surface. "When we look at these details of solar structures and dynamics, it reveals the dark secrets of sunspots," Kosovichev said. High-definition images of the sun's surface (left) and lower chromosphere (right) display dark solar pores and the granulation that surrounds them. Magnetic flux ropes interact with the plasma, deforming the granule before rising to the surface to violently eject solar material. Big Bear's high resolution also allowed for the detailed observations of granules, regions on the sun where plasma rises to the surface, much like bubbles in boiling water. A 70-minute movie created by data from the telescope allowed scientists to study granule evolution. The bubbles are enormous, averaging 900 miles (1,500 km) in diameter. At any given moment, 4 million granules may boil across the surface of the sun. "We have a lot of detailed information of what's going on at these small scales," Santiago Vargas Dominguez, also of BBSO, said at the same news conference. Analyzing the highest resolution solar observations ever made, Dominguez and his team followed the emergence of 6,000-mile-long (9,600 km) magnetic-flux ropes from inside of a granule to the solar surface and the powerful explosions that result. The process stretched and distorted the granule, creating "abnormal granulations" that the NSO imaged at approximately 40 miles per pixel. When the surging magnetic flux ropes hit other existing magnetic fields, they can spark magnetic reconnection, releasing large amounts of energy. Plasma on the sun heats up by hundreds of thousands of degrees, accelerating to speeds of 70,000 miles per hour in less than 10 minutes. Highly magnified images from the NST revealed another surprising image — an unusual event known as a three-ribbon solar flare. "Typically flares have two ribbons," Haimin Wang, of the New Jersey Institute of Technology (NJIT), said at the conference. Wang worked with Wendy Cao, also of NJIT, on a study of two successive three-ribbon flares that occurred within half an hour of one another. The more typical two-ribbon flares create powerful eruptions that can send storms of charged particles hurtling toward Earth at nearly the speed of light. The NST allowed the astronomers to see the event in great detail. "With the new observations from the new telescope, we can really magnify to see the structure of the flare," Wang said. At the NST's high magnification, the two connected loops of the flare twist together on one side, while the third sits on its own, asymmetrically twisted at a different orientation. The 1.6-meter New Solar Telescope captures 100 images in 15-second bursts, correcting images in real time to get the sharpest images available. The telescope is the most powerful ground-based instrument for solar observations.